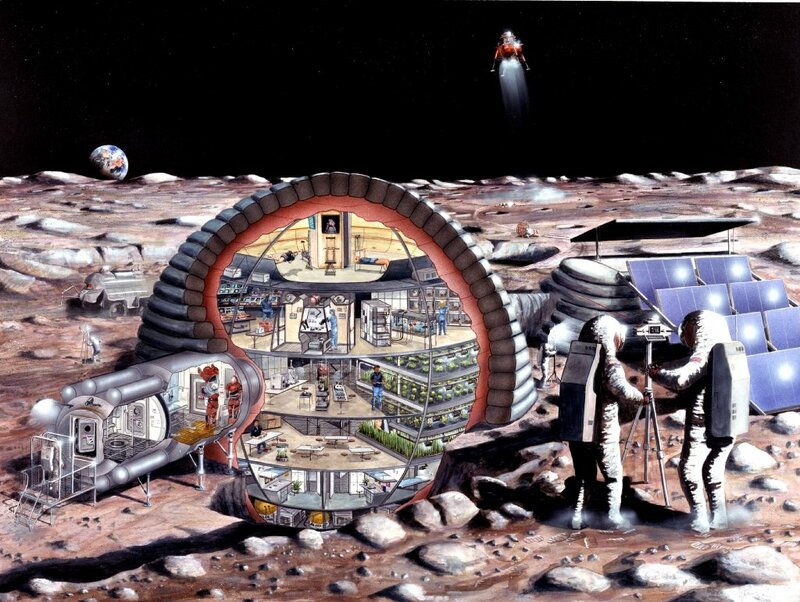 A sixteen-meter diameter inflatable habitat such as the one depicted here could accommodate the needs of a dozen astronauts living and working on the surface of the Moon. Depicted are astronauts exercising, a base operations center, a pressurized lunar rover, a small clean room, a fully equipped life sciences lab, a lunar lander, selenological work, hydroponic gardens, a wardroom, private crew quarters, dust-removing devices for lunar surface work and an airlock. A major concern of planners is the fine dust which covers the lunar surface and collects easily on astronauts garments, as evidenced by six crews of Apollo moon explorers. This special annex to the 16-meter diameter inflatable habitat (the airlock section) provides possible solutions to the dust problems, according to teams studying possible lunar expeditions. As much dust as possible must be removed, they say, before re-entering the habitat. The astronauts might pass through wickets which remove much of the dust. A performated metal porch would allow dust to fall through. Once inside the dust lock the astronauts would remove their white coveralls. An air shower could remove remaining dust with strong jets of air. An astronaut, after having removed as much dust as possible, would be able then to move into the airlock to doff his suit. The airlock could accommodate up to four astronauts at one time and suits could be stored there when not in use. On September 24, 2009 NASA announced the discovery of water on the Moon. The discovery was made by three instruments on board Chandrayaan-1. These were the ISRO's Moon Impact Probe (MIP), the Moon Mineralogy Mapper (M3) and Mini-Sar, belonging to NASA.